NOTE: The covers, titles, and descriptions changed as time passed – not all the websites have updated photos and book titles. But what I showed in today’s video are the printed books, so that’s what you’ll get when ordering! I’m so very happy for you. The books are marvelous! May you continue to be blessed by your giving & teaching to others! Aloha! WOW Sandy! Way to go! I know what I want for Christmas plus gifts for others! Hearty congratulations! Very excited for you. Wonderful accomplishment. Oh my goodness I can’t wait to get mine!! Congratulations Sandy!! Congratulations Sandy, I watch the video and the books are great. I am not a religious person but if I was I would certainly buy your book and workbook. I hope they are going to be a great succes, you derseve it! Congratulations! You deserve great success. Congratulations, Sandy… I know you put so much effort into this project – to see the final results must be so gratifying and exciting for you. Enjoy this day! Congratulations, Sandy! I know that you have worked so hard to make this possible, and I am so happy this success has come your way! You are a joyful, light-filled person and you inspire so many of us too! Congratulations! Congratulations on your well-deserved success! As a former OWH cardmaker and big fan of “Sunshine Sandy”, I’m honoured to support you with my purchases today. Your beautiful books are going to be wonderful gifts for my moms, MIL, and SILs. Congratulations again. I miss OWH, but following your blog is really heartwarming – it’s really got me through some tough times. The Lord blessed you with talent and you honor Him with your Bible journaling. Congratulations, Sandy! Congratulations, Sandy! 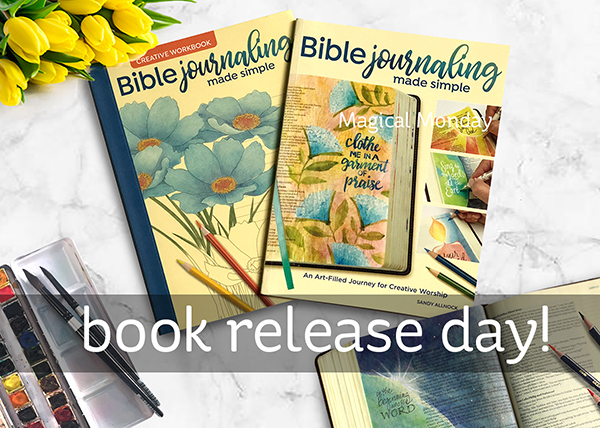 Although I don’t think that Bible journaling is for me, I can tell that a lot of love, thought and effort went into creating this book as well as the workbook. Congrats Sandy! Can’t wait until I get my copy. How exciting – huge congrats!! !